The St. Olaf Christmas Festival, an annual tradition since 1912, will be broadcast live on Sunday, December 5, at 3:30 pm on Minnesota Public Radio. This year’s festival runs from Thursday, December 2, through Sunday, December 5, and according to the St. Olaf website, only a limited number of tickets for the Thursday performance remain! In additional to the musical celebration, St. Olaf hosts a Scandinavian Buffet and author signings at the campus bookstore in advance of the performances. 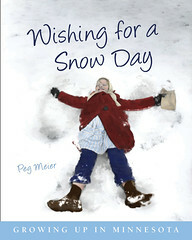 Minnesota’s Hidden Alphabet author David LaRochelle will sign at the store Friday, December 3, from 5:30 to 7:00 pm, and Peg Meier, author of Wishing for a Snow Day, will sign on Saturday, December 4, from 5:30 to 7:00 pm. Listen to the 2009 performance on the MPR site. 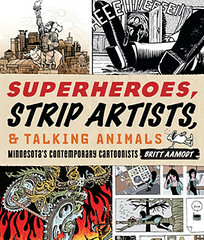 The Source Comics & Games in Falcon Heights celebrates Black Friday with a sale and signing with Britt Aamodt, author of Superheroes, Strip Artists, & Talking Animals: Minnesota’s Contemporary Cartoonists, starting at 9 a.m. this Friday. Bring two new or slightly used clothing items to donate to the Minnesota Lupus Foundation and the Source will double your discount. Word on the street is that the store will have door prizes, giveaways, free snacks, surprises, mayhem, and revelry! Britt will begin signing at 9 a.m. and stay a few hours, so get there early! Many of the artist contributors to the book will be on site to sign books as well. Hosting Thanksgiving at your house this year? It’s not too late to buy the cookbook, which has an approachable, tasty, step-by-step guide to cooking the grand meal. A game plan, if you will, that includes a chart of what can be done ahead. For instance, four days ahead of Thanksgiving (today!) you prepare the brine for your turkey and make the fabulous Pumpkin Ice Cream Pie for store-ahead freezing (one of Dean’s family favorites). Tomorrow you begin brining your turkey. And Wednesday, well, she has the list all ready for you, along with carefully tested recipes and cook’s notes for the feast. Can’t get out until this weekend to buy the book? That’s okay. Dean has seasonal menu ideas for other friends-and-family gatherings, including a holiday cocktail party and a last-minute winter party (those last-minute get-togethers sometimes end up being the best of the holiday gatherings!) Cheers! I decided I better tell them all before anyone else did, so I met them at the door, crying. It was not all put on either as I was really scared nearly out of my mind. Daddy can be quite fierce and mother gets mad at much less things than this. Well, I worked myself into a good case of hysterics and cried so hard I couldn’t talk. They got scared and probably thought I had found I had an incurable disease, or something. Daddy kept saying, “Come on now, nothing can be as bad as all that.” Finally I decided they would probably forgive me anything they were so scared I would die of hysterics. They were very kind about it and decided I was being punished enough at school and I can even go to dancing school on Friday. It pays to know how to manage things. If I had been defiant, things might have had a disastrous turn for the worse. As it is, I feel so peaceful I can even enjoy being a martyr now. Meier is appearing at readings in Red Wing, Fergus Falls, Minneapolis, Wayzata, Northfield, and Minnetonka between now and Christmas. Stop by and say hello! 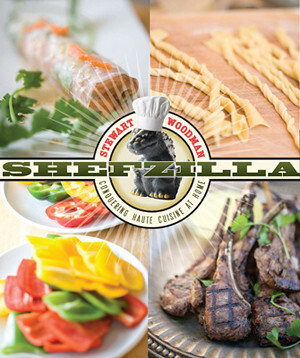 Warm up with this recipe from Stewart Woodman’s new book, Shefzilla: Conquering Haute Cuisine at Home. 1. Add canola oil to a medium saucepan and heat on low; add parsnips and cook until lightly caramelized, about 30 minutes. 2. Add coffee beans and sweat 5 minutes. Add sake and turn heat to high; reduce until almost all liquid has evaporated, about 2 minutes. Add cream, water, and salt; bring to a boil and simmer 10 minutes. Remove from heat and add sage. 3. Working in batches, place soup in container of electric blender, cover and process until smooth. 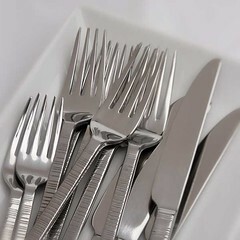 Strain, discarding solids, and serve. 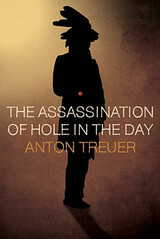 The Assassination of Hole in the Day continues to garner wonderful attention as Anton Treuer fields interview requests and gives readings across the state, spreading the word on this fascinating Anishinaabe leader. Treuer was interviewed by Richard LaFortune and Laura Waterman Wittstock on First Person Radio on November 10, and he appeared on TPT’s Almanac on November 12. You can see him in person at readings, now through January, in Walker, Little Falls, Longville, Blackduck, Minneapolis, Cass Lake, and Bemidji. I Spy With My Little Eye . . . . If you have kids, you know the drill, “I spy with my little eye. . . . ” Our new book, Minnesota’s Hidden Alphabet by Joe Rossi and David LaRochelle, is the perfect guide for an “I Spy” game in nature–using the letters of the alphabet. Since our Minnesota autumn has been unseasonally warm and the weekend is just on the horizon, plan a walk through city or woods and see what wonders you might discover. This morning I noticed my fallen tomato vines curve gently down the trellis into the shape of an “S.” And the missing top to my Halloween pumpkin (alas, still on my porch steps!) reveals a perfect “O” when I peer down into the gourd. And, we’re in luck. Authors Joe Rossi and David LaRochelle will be speaking and signing books at The Red Balloon Bookshop on Grand Avenue in St. Paul, Saturday (tomorrow! ), 11/13/10, at 2 p.m. They’ll have even more tips on seeing nature, sharing your finds, and having all kinds of family fun. See you there! MPR.org’s Updraft blog has an interesting piece focusing on the weather forecasting tools available at the time of the sinking of the Edmund Fitzgerald and how the accident may have been prevented had the technology been as advanced as it is today. “The Fitz storm began as a fairly moderate low pressure system in Kansas on November 9th. The central pressure at the time was 29.53″. 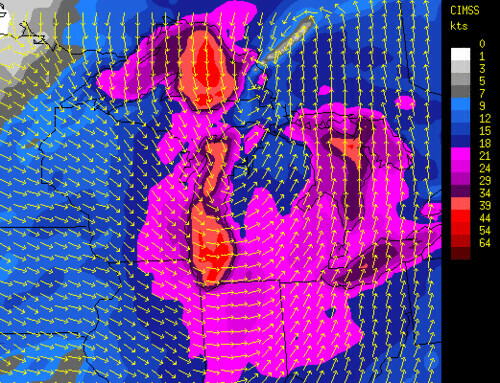 By the morning of November 10th the surface low had raced all the way to Marquette, and deepened to 29.00″. Later that evening, the low was near James Bay in Ontario with a surface pressure of 28.88″. That’s the equivalent of a Category 2 hurricane on the Saffir-Simpson hurricane intensity scale! Split Rock Lighthouse in Two Harbors is having its annual lighting of the beacon today from 12 to 6 in memory of those who lost their lives on the Edmund Fitzgerald. 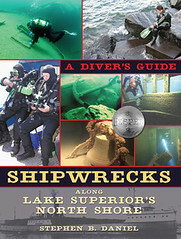 For more information on other shipwrecks of Lake Superior, check out the MHS Press book by Stephen Daniel. 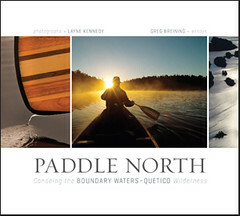 Paddle North: Canoeing the Boundary Waters-Quetico Wilderness, with photographs by Layne Kennedy and essays by Greg Breining, is available in bookstores now. The book reflects on the spirit of place, conveying an open invitation to visit an ages-old wilderness. To view images from the book, check out Layne’s appearance on KARE 11. Greg will present a talk on the “Boundary Waters of the 21st Century” and sign books at the Outdoor Expo, sponsored by Midwest Mountaineering, on Saturday, November 20, at 10:30 a.m.
Layne and Greg will also sign copies on Sunday, December 5, from 2 to 3 p.m. at the Minnesota History Center Bookstore and on Sunday, December 12, at 2:00 p.m. at the Barnes & Noble Har Mar.